You must be 21 or over to purchase or posses recreational marijuana. Proof of age with valid state picture ID is required. What is the difference between medical and retail marijuana? 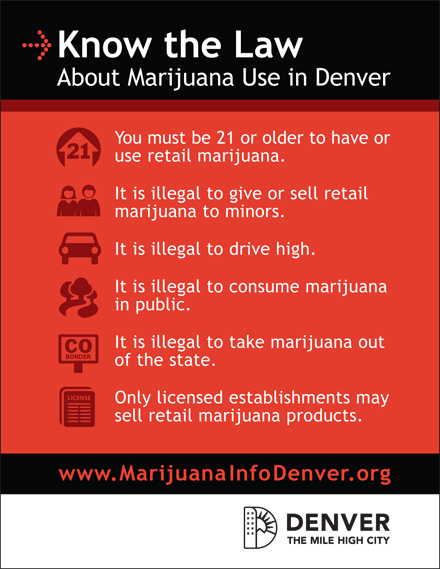 Only licensed retail marijuana stores may sell retail marijuana, and only to those 21 and older.Medical marijuana requires a state red card, which can only be obtained by Colorado residents with a recommendation from a doctor that a patient suffers from a debilitating medical condition that may benefit from medical marijuana. Medical marijuana patients can obtain marijuana from a licensed center, a primary care giver or self grow. For more information about medical marijuana, please visit the Colorado Department of Public Health and the Environment. Those 21 and older can purchase retail marijuana at licensed retail stores.Other municipalities in Colorado also allow retail marijuana stores. Please go to each city’s website to determine specific marijuana sale and consumption laws. Where am I allowed to consume retail marijuana? Retail marijuana is intended for private, personal use. Such use is only legal in certain locations not open or accessible to the public. Marijuana may not be consumed openly or publicly. Can I consume marijuana in a licensed retail store? No, it is illegal to consume marijuana in or around a licensed store. It is also illegal to smoke at indoor-but-public locations such as bars, restaurants and common areas in buildings. Can I possess marijuana? And how much? Since Amendment 64 went into effect in late 2012, adults 21 and older have been allowed to possess up to 1 ounce of retail marijuana. How much marijuana can I purchase at one time? Adults 21 and older can purchase and possess up to 1 ounce of retail marijuana at a time. What are the consequences if I violate marijuana laws? Penalties range from a fine to a possible jail or prison sentence. Colorado State Statutes and Denver Revised Municipal Code spell out the specific penalties for various violations.Schools, universities and employers are allowed to put in place their own disciplinary actions for marijuana-related infractions. Are the rules different for possession and consumption of edible marijuana than for marijuana that can be smoked?